‍This is a real photo of the notice board in the meeting room of a Blackpool police station. Absolutely no identity. 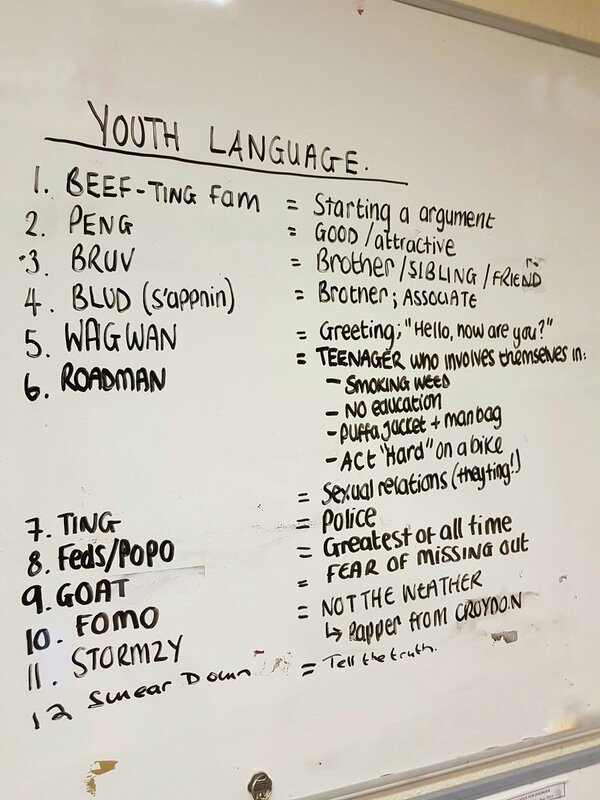 Influenced by criminal behaviour/grime music (hard to distinguish the difference sometimes), they feel they must use street slang to feel empowered. Sad really. ‍How does this help detect/prevent crime exactly? 'Bro' - Even if the person is not talking to their brother, it's used after every sentence. 'Sick' - I saw a bit of Love Island and a qualified doctor was using the word 'sick' all the time to describe something great. It doesn't even make sense. Are you beef ting fam with the feds/popo? Magic147 wrote: Are you beef ting fam with the feds/popo? I despise the use of the word "safe" or "standard" at the end of conversations. You don't get much more chavvy than that. ‍the apprentice at work speaks like that, it gets me all aggy and makes me want to punch him into tomorrow. i've had a yoof say to me "you looking to get wetted, blud?" I approve of the username.